I recently was fortunate to get my hands on the 24/7 Big Dot Sight from XS Sight Systems. I have known about XS Sight Systems for several years as they have been making aftermarket sights and optics for close to 2 decades now. But, I have always been very stubborn, sometimes to a fault, about changing anything on my every day carry (EDC) gun. I began to really have some interest in a quality self-defense pair of aftermarket sights for my EDC, and with a stroke of luck, I was put into contact with XS Sight Systems. I was initially drawn to the XS Sights 24/7 Big Dot Sight, because of its design. Ninety-nine point nine percent of my mind set and training revolves around defensive shooting. My objectives are to secure Quick threat acquisition and combat-accurate, high volume of fire. While I do occasionally plink and practice slow, high precision shots, my concern is seldom how ‘pretty’ the target looks. All this leads me to why I like the 24/7 Big Dot’s design. It is a very simple sighting process that I can best describe as “very intuitive.” The 24/7 Big Dot model has a very large tritium filled front sight dot, and a shall ow “V” cut rear sight that uses a tritium filled vertical line. With this design, your sight alignment is accomplished by “dotting the I.” The large, front sight dot is placed on top of the vertical line in the rear sight, making it look like a lollipop. This sight alignment is intuitive because your mind can easily and quickly place those two objects together. 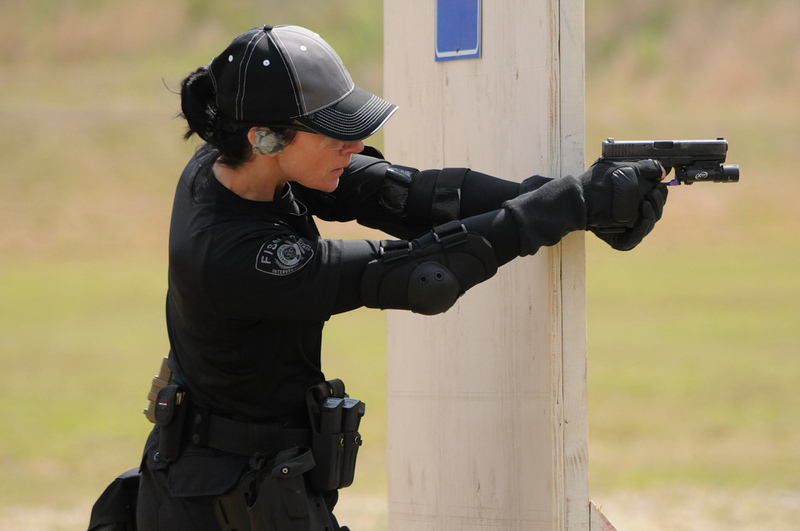 Many self-defense shooters rarely use their sights, and rely on point shooting. This is where you are using the combination of grip and kinesthetic awareness to place shots on the threat. Think of literally shooting from the hip, where you don't look at your sights whatsoever. This technique can be perfected and used even up to around 15 – 20 feet. Self-defense shooters can also get into what I call the in-between zone, where they are too far to use point shooting, but don't really need to use both their front and rear sights. In this zone, the shooter can quickly acquire the front sight, place it on the target without ensuring it is aligned with the rear sight and combined with proper grip and kinesthetic awareness, squeeze the trigger. 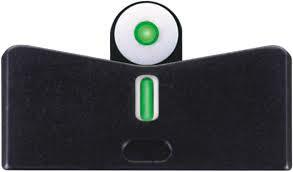 The big front sight dot is great for this because it is very prominent and easy to pick up. The sights are set up to be point of aim, point of impact (POA/POI). This means wherever the front sight dot is, the bullet will impact. Combining its size and the fact that it is set up to be a POA/POI, you can just drive the gun out, place the front sight where you want to hit, and squeeze the trigger. Both the front dot and rear vertical line in the 24/7 model are Trijicon tritium filled. The tritium produces its own luminescence, as opposed to fiber optic which relies on ambient light. And your tritium glow will last well over 10 years! I know you want to know how they performed right? Well, first I have to tell you about the removal and installation process, because I decided to do it myself instead of taking it to an armorer. I received the 24/7 Big Dot Sight for my Glock 27 .40 cal. Like I mentioned above, I received the ‘Big Dot’ front sight and tritium version front and rear sight. There are also non-tritium versions, and big, and standard sized front sight dots. Additionally you can also purchase the front or rear sights individually if you want to do that. In the package, I found my front and rear sights of course, but was relieved to find a Glock front sight removal tool, plastic drift punch for removing the rear sights, and a large tube of Lok-Tight. Additionally the instructions included were full of color and easy to follow. I also found several instruction videos online that showed the process of removal and installation. Because XS Sight Systems included every tool I needed, minus a hammer and a roll of duct tape (using the roll of duct tape to support the gun while removing the rear sights makes it much easier), it took me about 30 minutes to remove my stock sights and install the new sights. I had to file the rear sight down just a touch to allow it to slide into the rear sight groove. About 20 passes over a very fine metal file did the trick. It was easy to align them just by eyeballing the sights. Once they were installed, I couldn't wait to get to the range, but it was raining pretty hard so, of course I dry fired like a mad man. I found I really had to re-train the way my mind worked when it came to using my sights. Because I have carried my Glock 27 and its factory sights for nearly 7 years, I found my brain was slightly confused when I wanted to quickly acquire my sights. Just the same as if you decided to move your holster from appendix carry to small of the back. It’s going to require you to build up new muscle memory for your draw. When I finally got out to the range I wanted to see how they performed in quick front sight acquisition shooting. I train a lot within that 0-25 foot deadly force encounter space, so I wanted to try it out in this zone. I was pleased about how quickly I was able to pick up the big dot, and put rounds on the target. I saw some reviews where shooters complained that the sights were very difficult to use when shooting at longer distances. I went out to and engaged the target everywhere between 30 – 40 feet. I found it pretty hard to stay consistent at first. The front sight dot is very large and when putting it atop the vertical line, there is a lot of ‘wiggle room’ for precise accuracy. By no means was I dangerously inaccurate, but I felt I had a little less precision than with my factory sights. BUT, I kept on shooting. And, a funny thing happened. I began to get more consistent and my precision increased. I would honestly say, I am probably more precise with my factory sights from 30 – 40 feet plus, but honestly who cares? What about a hostage situation, you ask? Still, I don't care. I say this because even with my continual training and proficiency, taking a high precision, 40 foot plus shot with my Glock 27, on a hostage taker, who may be holding my family member at gunpoint, is not going to happen. My tactical training and experience would tell me to tactically close the gap in order to get a better, higher probability shot. At a certain point, I guess you could make an argument for putting a scope on your EDC for the ‘hostage shot’ situation if your thing is long range ultra precision shots. For me, I was able to closely match my distance accuracy while using the Big Dot sight and was able to quickly acquire my front sight which I felt made me quicker in that in-between zone I mentioned above. Remember, this sight is designed as a combat accurate sight, not a long distance precision sight. This isn't for competitions. It is for quick sight acquisition in that self-defensive shooting zone from 0 – 25 feet or so. I shot over two days and put roughly 150 total rounds through the gun at various distances. For time reasons, the video was edited down and only shows some of the shooting I did with the sights, but the results were terrific. Overall I am impressed. From the jump, the customer service I received was incredible. This is so important to me in any company I purchase from. Sometimes, good customer service is what tips the scales toward purchasing a product from a company. I have heard a number of stories and read many reviews of how XS Sight Systems has taken excellent care of customers issues, and have gone above and beyond in helping with installation and warranties. The installation was simple and straight forward, although I can only speak about Glock sight removal and installation. The performance was what I wanted in the sight. There was definitely a learning curve in shooting these sights. More like a reprogramming of how my brain perceived my sight under stress. Once I practiced with them I became much more proficient and accurate at a distance, to the point that I do not think I am giving up any critical accuracy between my stock sights and these 24/7 Big Dot sights. If you are looking for some quality self-defense sights I would try these sights out.